Tue 9:00 a.m. 7:00 p.m.
Craving the purest riding experience around? Look no further. Lots of riders believe less is more, and that’s why so many like this bike. The CB300F was designed to be lighter, smaller and simpler, but it’s still loaded with features. And with its user-friendly size, it’s a great choice for the city and makes an ideal first bike. Like our CBR300R, the CB300F uses a totally up-to-date single-cylinder engine. The fuel injection system and electric start make it convenient, but the best feature of all may be its combination of enthusiastic power delivery along with awesome fuel efficiency. Practical meets performance—it’s not an either/or proposition with the CB300F—you get to have your cake and eat it too. 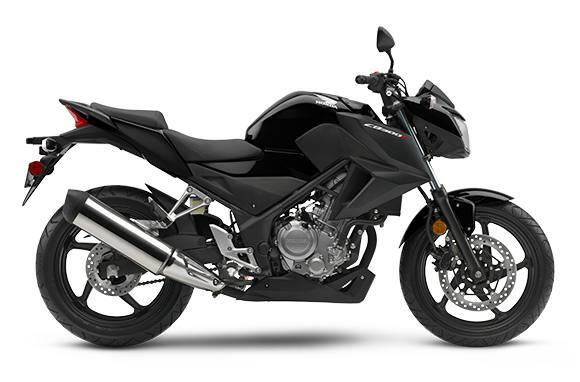 Low and Nimble: The CB300F’s narrowness helps make it one of the most maneuverable bikes around. This is all thanks to its single-cylinder engine, low 30.7-inch seat height and light 348-pound curb weight. What you get is a bike that’s easy to put your feet down at a stoplight and a blast to ride the moment it turns green. Singular Accomplishment: The crowning achievement of the CB300F is its single-cylinder engine with fuel injection, double-overhead cams and a counterbalancer. What you get is the kind of torque and midrange power that’s well suited for all levels of riders. Ride More. Fill Up Less: The CB300F rocks when it comes time to fill up. With a fuel economy estimate of 78 MPG*, you’re more likely to be laughing at high gas prices. Plus, the CB300F can carry a passenger and is freeway capable. Get all the versatility you need. Disc Brakes: The CB300F features front and rear hydraulic discs for excellent stopping power and brake feel. The single front 296mm and 220mm rear hydraulic discs helps keep things simple and lowers unsprung weight, too. Under-seat Storage: Removing the rear passenger seat provides a lockable area to throw a map, gloves, or a spare set of sunglasses. Passenger Ready: A separate passenger seat, integrated grab rail, and standard passenger footpegs mean you can take a friend along when you go riding–another example of the CB300F's versatility. Narrow Seat & Low Seat Height: A low 30.7-inch seat height does more than help make sure the CB300F fits a wide range of riders. It makes it easier to put your feet down at stoplights and in parking lots—a big confidence builder. Pro-Link® Rear Suspension: The CB300F uses a single-shock preload- adjustable rear suspension that not only gives you a smooth ride, but helps enhance handling as well, just as on some of our larger sport models. Counterbalance Shaft: Because it features a counterbalancer, the CB300F engine is a smooth runner. You get the narrow overall width and power advantages of a single along with the smoothness of a multi-cylinder bike. Single-Cylinder Engine: A single is the perfect choice for a bike like the CB300F. It's light, simple, provides excellent fuel efficiency and features a broad powerband with plenty of low-revving torque—just what you want in your first motorcycle. Fuel Injection: Fuel injection means the CB300F starts right up, even in cold weather. Compared to a carbureted bike, it also helps reduce emissions and enhance performance and fuel efficiency. Clean, Open Design: Less is more with a CB300F. The minimal bodywork gives this machine a clean, open naked styled sport bike look that’s not only cool but that helps make it even lighter. Multifunction Digital Instrumentation: The CB300F’s digital gauges with analog tachometer provide vital riding information in a styled, hi-tech instrumentation package featuring digital speedometer, fuel gauge, coolant temp, tripmeter/odometer and clock. Curb Weight: 348 lb. Includes all standard equipment, required fluids and full tank of fuel-ready to ride. Miles Per Gallon: 78 MPG - Honda's fuel economy estimates are based on EPA exhaust emission measurement test procedures and are intended for comparison purposes only. Your actual mileage will vary depending on how you ride, how you maintain your vehicle, weather, road conditions, tire pressure, installation of accessories, cargo, rider and passenger weight, and other factors. Specifications subject to change without notice. Honda’s fuel economy estimates are based on EPA exhaust emission measurement test procedures and are intended for comparison purposes only. Your actual mileage will vary depending on how you ride, how you maintain your vehicle, weather, road conditions, tire pressure, installation of accessories, cargo, rider and passenger weight, and other factors. Suggested Retail Price (SRP) excludes destination charge. Visit powersports.honda.com to view applicable destination charge amount. 0.99% Fixed APR on 2019 Gold Wing! 0.99% fixed APR financing for 24 -60 months available through Honda Financial Services for customers who qualify for preferred credit tier. Not all buyers may qualify. Higher rates apply for buyers with lower credit ratings. Check with participating Honda dealers for complete details. Special APR finance offer ends 07/06/2019. 0.99% Fixed APR on 2019 Gold Wing DCT! 0.99% Fixed APR on 2019 Gold Wing Tour! 0.99% Fixed APR on 2019 Gold Wing Tour Airbag DCT! 0.99% Fixed APR on 2019 Gold Wing Tour DCT! 0.99% Fixed APR on 2018 Gold Wing! 0.99% Fixed APR on 2018 Gold Wing DCT! 0.99% Fixed APR on 2018 Gold Wing Tour! 0.99% Fixed APR on 2018 Gold Wing Tour Airbag DCT! 0.99% Fixed APR on 2018 Gold Wing Tour DCT! $500 Factory-to-Dealer Incentive offer is valid with the purchase of new and unregistered 2019 Shadow Aero models. Factory-to-Dealer Incentive can only be used for purchases at the dealership and must be redeemed on the date of purchase. Offer has no cash value and is not transferable. Redemption value not to exceed $500. Check with participating Honda Dealers for complete details. Offer valid through 07/06/2019. $500 Factory-to-Dealer Incentive offer is valid with the purchase of new and unregistered 2019 Shadow Phantom models. Factory-to-Dealer Incentive can only be used for purchases at the dealership and must be redeemed on the date of purchase. Offer has no cash value and is not transferable. Redemption value not to exceed $500. Check with participating Honda Dealers for complete details. Offer valid through 07/06/2019. $750 Factory-to-Dealer Incentive offer is valid with the purchase of new and unregistered 2019 Fury models. Factory-to-Dealer Incentive can only be used for purchases at the dealership and must be redeemed on the date of purchase. Offer has no cash value and is not transferable. Redemption value not to exceed $750. 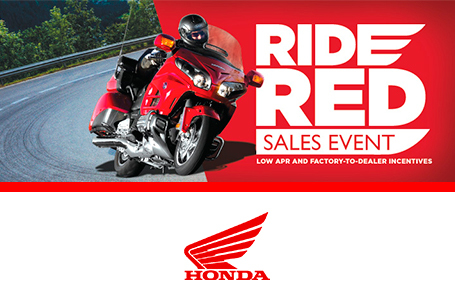 Check with participating Honda Dealers for complete details. Offer valid through 07/06/2019. $750 Factory-to-Dealer Incentive offer is valid with the purchase of new and unregistered 2019 Fury ABS models. Factory-to-Dealer Incentive can only be used for purchases at the dealership and must be redeemed on the date of purchase. Offer has no cash value and is not transferable. Redemption value not to exceed $750. Check with participating Honda Dealers for complete details. Offer valid through 07/06/2019. $1000 Factory-to-Dealer Incentive offer is valid with the purchase of new and unregistered 2019 CBR600RR models. Factory-to-Dealer Incentive can only be used for purchases at the dealership and must be redeemed on the date of purchase. Offer has no cash value and is not transferable. Redemption value not to exceed $1000. Check with participating Honda Dealers for complete details. Offer valid through 07/06/2019. $1000 Factory-to-Dealer Incentive offer is valid with the purchase of new and unregistered 2019 CBR600RR ABS models. Factory-to-Dealer Incentive can only be used for purchases at the dealership and must be redeemed on the date of purchase. Offer has no cash value and is not transferable. Redemption value not to exceed $1000. Check with participating Honda Dealers for complete details. Offer valid through 07/06/2019. $500 Factory-to-Dealer Incentive offer is valid with the purchase of new and unregistered 2019 CB300R models. Factory-to-Dealer Incentive can only be used for purchases at the dealership and must be redeemed on the date of purchase. Offer has no cash value and is not transferable. Redemption value not to exceed $500. Check with participating Honda Dealers for complete details. Offer valid through 07/06/2019. $500 Factory-to-Dealer Incentive offer is valid with the purchase of new and unregistered 2019 CB300R ABS models. Factory-to-Dealer Incentive can only be used for purchases at the dealership and must be redeemed on the date of purchase. Offer has no cash value and is not transferable. Redemption value not to exceed $500. Check with participating Honda Dealers for complete details. Offer valid through 07/06/2019. $400 Factory-to-Dealer Incentive offer is valid with the purchase of new and unregistered 2019 CRF250R models. Factory-to-Dealer Incentive can only be used for purchases at the dealership and must be redeemed on the date of purchase. Offer has no cash value and is not transferable. Redemption value not to exceed $400. Check with participating Honda Dealers for complete details. Offer valid through 07/06/2019. Tue: 9:00 a.m. - 7:00 p.m. Wed: 9:00 a.m. - 6:00 p.m.